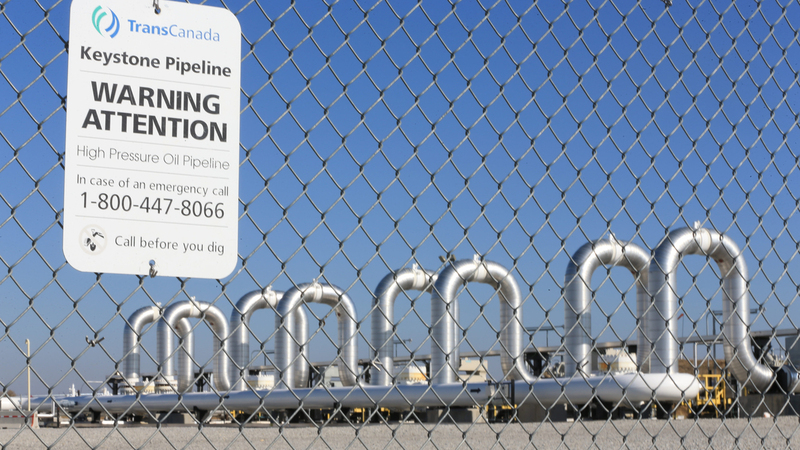 TransCanada Submits New Application To Build Keystone XL Pipeline : The Two-Way The pipeline would transport crude oil from Alberta to Nebraska. President Obama blocked it. President Trump told the company to refile for a permit and promised to speed the approval process. The planned Keystone XL pipeline, if approved, would connect to the Keystone Steele City pumping station in Nebraska, seen here in 2015. The Keystone XL is an important project for Canada's oil sands companies because it would transport their crude from rural Alberta to Steele City, Neb. From there, existing pipes would move it to the Gulf Coast where crude can fetch higher prices, either from local refineries or on the world market. On Tuesday, Trump also signed a memorandum directing the commerce secretary to develop a plan to ensure pipelines constructed in the U.S. are built with pipes manufactured domestically. That could be a tricky problem for TransCanada. "We have procured a lot of the materials already, most of that was purchased within North America," said TransCanada President and CEO Russ Girling at an investor conference in British Columbia Wednesday. In 2012 TransCanada said half the pipe for the Keystone XL project would be purchased from a mill in Arkansas. The rest was to be manufactured in Canada, Italy and India. But then the Obama Administration rejected a permit application from TransCanada in 2015 because of environmental concerns. That announcement was cheered by environmentalists and condemned by the oil industry and its supporters. After TransCanada submitted its new application, American Petroleum Institute President and CEO Jack Girard called it, "...an important step forward to building a 21st Century energy infrastructure system across our nation." Environmentalists and landowners say they are ready to oppose the Keystone XL again. Upon learning that Trump planned to speed approval for the project, Dallas Goldtooth with the Indigenous Environmental Network told NPR, "It's only going to result in more mass mobilization and civil disobedience on a scale never seen by a newly-seated president."